New manager Billy Heath is targeting an immediate return to the National League for FC Halifax Town. The former North Ferriby boss signed a full-time two-year contract earlier this week, replacing FA Trophy winning Jim Harvey, who left the club after they decided not to renew his contract. Heath guided North Ferriby to promotion from the Conference North this season, and is targeting a repeat performance with Halifax next term. He said: “The odds are probably stacked against us getting back-to-back promotions but I’m hoping that’s what we can do. “We’ve come to Halifax with a view of having one season at this level and going straight back up. “But there are probably 12 other teams in the league this season thinking that. “I think it’s probably the strongest it has been for a number of years with the teams coming down and going up into it. “But promotion is what everybody expects. It is believed five players - Jordan Burrow, Josh Macdonald, Kingsley James, Scott McManus and Connor Hughes - are currently under contract at the club for next season, with the futures of the rest of the squad seemingly up in the air. 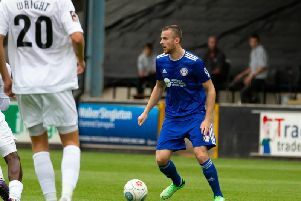 Heath said he understood the decision of defender Hamza Bencherif to join Wrexham earlier this week, and revealed he was offered a contract to stay with Halifax. The Town boss approves of the offers that have been made for some of the players to stay, but is impatient to hear answers so the job of rebuilding the suad can begin. “There are offers on the table for players, and they have been there for two or three weeks now,” he said..
“We have to find out who is staying or going before we can bring anyone in. “I understand some players will want to stay in the Conference Premier, but I’m hoping quite a few of them stay. “Obviously I wasn’t involved in that because that happened two or three weeks ago, but I’ve looked at who has been offered deals and I’m happy with that. “We have targets in mind but there’s no point looking for certain targets when players in that position may already be at the club. “We need to get some answers by the end of the week. “We’ll start pre-season training at the back end of June which is barely four weeks away and I like to have my squad in place on the first day of pre-season training. “You don’t want to be looking at players two weeks before the start of the season. Heath admits some of the players he brings will probably be following him from North Ferriby. “When any manager moves he usually brings players with him and I’m no different,” he said. “When we’ve been successful it’s only natural you’ll try and bring some of that team with you. “We may bring one or two or it may be more than that. Heath has a clear idea of what he wants his Halifax team’s main asset to be. “Hard work - everybody knows that about the teams I assemble,” he said. “Whatever else the players bring technically, every player will work hard - that’s what we expect. “If you’ve got that and the team spirit is right you can achieve things. “We were very much together as a team at North Ferriby, we were well organised and all the players knew exactly what was expected of them - there were no grey areas. “That has been our recipe for success. Heath is also looking for hard work in any player he brings in, and concedes there is no time to lose in constructing his squad. “We’ve got to get busy,” he said. “We’re going to have to work hard in the next three of four weeks, but it doesn’t faze me. “We have to choose the right players that want to work hard. “There are a lot of good players out there but they have to be the right characters. Heath, who lives in Hull, will be assisted by his right-hand man Mark Carroll, and explained that their relationship goes back a long way. “I’ve known him since I was 10 years old,” Heath said. “We played together when we were boys in the Sunday League in Hull. “We were both apprentices at Hull City between the ages of 16 and 18. “We’ve been in management for 17 years and it’s been a great relationship. “He has lots of input into every detail but he isn’t a yes man, he has his own opinion. Heath says the offer from FC Halifax Town was too good to turn down after he left recently-promoted North Ferriby. The 45-year-old guided North Ferriby to victory in the Conference North play-off final less than two weeks ago, with the Humberside club replacing Halifax in the National League after The Shaymen’s relegation. But Heath insists he has joined a bigger club in Halifax, and is relishing the chance to wake what he describes as a ‘sleeping giant’. He said: “When a club like Halifax comes calling you can’t turn it down. “It’s an established club that has played in the Football League. “It wasn’t a hard decision to make. “The club’s structure is ready to go back into the Football League. “There are limits to the finances available at North Ferriby but there aren’t the same limits at Halifax. “When you compare the clubs side by side, North Ferriby is a village club and it was unbelievable to get them into the Conference Premier. “Halifax is a sleeping giant and myself and Mark want to manage at a big club. “People will think ‘why, when we’ve just got promoted, have we decided to leave?’, but we are looking at the long-term. Heath has called on the Town fans to throw their support behind him and Carroll. He added: “Get behind us. Get behind the team and get behind me. “We have won things elsewhere and hopefully we can win things here. “We got promoted this season and our record is there for everyone to see at North Ferriby. “I went to Halifax at the back end of the season when they played Boreham Wood and the crowd were magnificent. “You wouldn’t have known the club were in a relegation battle. “Sometimes in that situation the crowd can get on the players’ backs but that wasn’t the case.